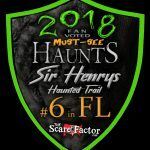 Sir Henrys Haunted Trail is a Haunted Attraction located in Plant City, FL. Team Giraffic Shark reviewed this Haunted Attraction on October 12, 2018. NOTE: SIR HENRY’S HAUNTED TRAIL and OMINOUS DESCENT operated out of the same location again this year, named I4 PREMIER FEAR PARK. While these businesses are completely separate entities, they did naturally share some assets including the general scare grounds, site upgrades, the new laser tag, and escape room offerings. They also offered combo tickets including admission to both attractions. 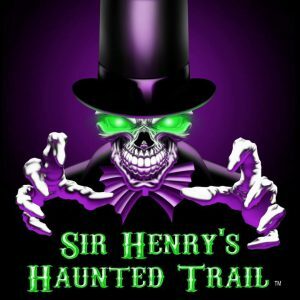 SIR HENRY’S HAUNTED TRAIL has spent much time, effort, and energy on updating their attractions and general premises for 2018. They have spent a lot of time and money on the infrastructure of the location to elevate the atmosphere and Guest experience. Trails have incorporated more technology and a higher level of design, and the grounds include a new fence and entrance portal, as well as new illuminated attraction signs that make great identifiers for each location. They also added a projector and projection screen behind their iconic SIR HENRY statue, featuring some themed videos to evoke a haunted atmosphere, along with providing a backstory for the attractions. SIR HENRY’S HAUNTED TRAIL features a wide range of performers, including a large amount of younger performers, likely leading in the decision to create an orphanage themed attraction this year. 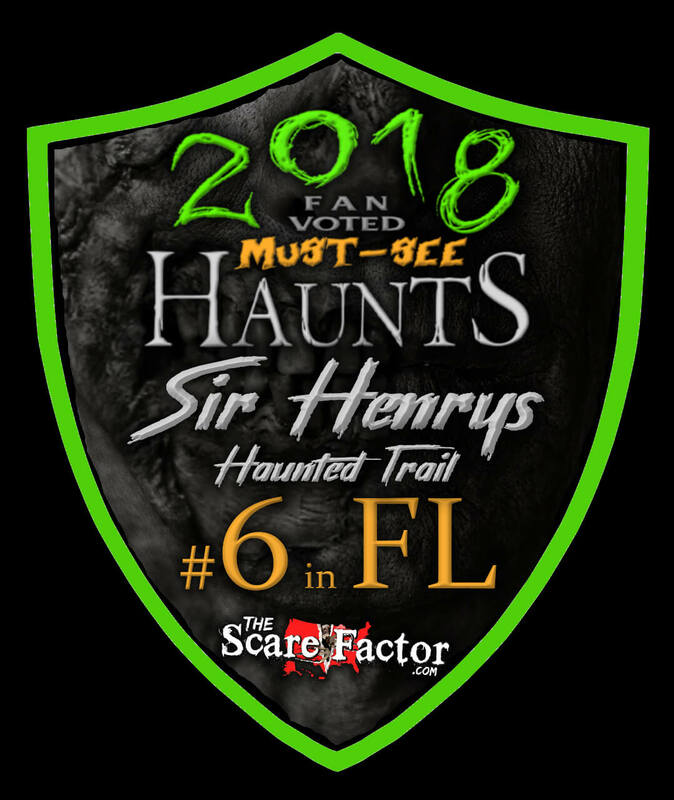 SIR HENRY’s performers stepped up their game for 2018, providing stronger scares overall. There are times, especially in SILENT WALLS, where Cast relies too heavily on scream scares, with no other dialogue but just banking on a shrill scream to the ear as their scare tactic. The Cast were very effective as creepy orphans, however, these creep out moments were occasionally ruined when the performers would switch directly into a pop scare, creating a disjointed performance. Overall though, the increase in performance was notable, with credit due to direction as well as the actors themselves. Costuming at SIR HENRY’s has improved in the past year, featuring more complete looks, including detailed makeup and masks. The detailed costumes likely helped the performers bring their roles to life as they had a more realistic foundation to build on. SIR HENRY’s appropriately and successfully camouflages performers as necessary to help them hide in the scenes, whether all in black to hide in the darkness, or detailed suits to allow performers to hide among the forest floor. Customer Service at I4 PREMIER FEAR PARK is always the best. The ticket booth, food stand, and haunt workers are friendly, engaging, willing to help, and go the extra mile to engage in conversation when appropriate. The haunt owners of both attractions are also extremely accommodating, friendly, and passionate for what they do, which gets carried through to their Guests, creating a very friendly atmosphere. Safety is also a top priority, and though these attractions take place in the middle of the woods, the team goes to great lengths to ensure safety on the trails including level pathways, and illumination of any potential hazards. I4 PREMIER FEAR PARK features amenities including restrooms, and though they may be portable restrooms, they are by far the cleanest we have ever seen at a haunt. The ticket booths also have extra bug spray on hand for those buggy evenings, which are plentiful in the Florida forests. I4 PREMIER FEAR PARK has spent extra time on improving the general atmosphere of the attraction for 2018. They have created an impressive entrance arch and fence, along with adding more atmosphere effects (more themed music and lighting) to create an enhanced atmosphere. They added a projection screen behind the SIR HENRY statue to display a loop of trailers and other videos for the haunted attractions, perfectly setting the mood and atmosphere for the location. With the fire pits and other great features of the scare grounds, I4 PREMIER FEAR PARK has worked hard to create a destination for a night out, rather than a couple haunted attractions to visit briefly. The quality and design of the SIR HENRY trails has improved quite a bit, with lots of time and energy put into creating themed environments with strong detail and well placed and creative special effects to add to the experience and fit with the themes of the attractions. As the haunt continues to grow and profit, more of these simple, yet effective special effects are sure to be incorporated, continuing to strengthen the design and experience of the attractions. With the dark layout of the trails, simple special effects do seem to pop out and be more effective since they are delicately peppered through the attractions. Some of the effects are rather exposed to Guest view including sensors, speakers, etc. Most Guests are running past these items or cowering in fear, but a little more effort to camouflage certain pieces could allow for more surprises, and a stronger illusion. We are looking forward to seeing the continued improvements in the years to come as it seems evident that the folks at SIR HENRY’s never seem to rest or plateau. SIR HENRY’S HAUNTED TRAIL has two highly themed attractions this year, elevating the level of backstory and theme from 2017. In order to help tell the themes, a brief story is posted at the entrance to each attraction. This is always a plus for those who may not have taken a close look at the website or any other materials prior to showing up at the attraction. Highly themed facades have also been created for each attraction to aid in setting the mood prior to entering the haunt. This helps to create an identifying landmark for each and sets the theme right from the start. The theme is carried throughout the attractions with few deviations or misplaced items, making for great themed experiences overall. Continuing on a theme, for those who have visited SIR HENRY’S in the past, expect MORE for 2018. In all categories, SIR HENRY is bringing MORE to the table. These trails are scarier this year, with surprises around every corner, including updated and added effects, as well as more seasoned performers using those effects to their benefit. This included a performer in the laser swamp who even got the most stoic of our team to jump and yell something not to be repeated in this review, an impressive feat to say the least. While there are a few missed scare opportunities from the cast, especially when it comes to scare follow through and the variety of scare tactics, a great improvement was noticed overall. It is good to see such growth in just one year, and our team looks forward to seeing the updates made each year as SIR HENRY is always creating completely new attractions with creative, original ideas each year, providing a high level of repeat visit interest from fans. I4 PREMIER FEAR PARK features a combo ticket option for all three trails, totaling 30 dollars, prior to any add-on options (escape room, laser tag, multiple admissions, etc.) For a mere $45 dollars, Guests can access the three haunted attractions multiple times, along with one admission to laser tag AND the escape room, which is a great value for an entire night of entertainment. It took us around 26 minutes to complete all haunts giving them 0.87 MPD (minutes of entertainment per dollar). Food, snacks, and beverages are also very reasonable and help round out the evening with even more to do. For much less than the local theme park Halloween events (and MUCH less crowded), and just as many (if not more) scares, I4 PREMIER FEAR PARK (featuring SIR HENRY’S HAUNTED TRAIL and OMINOUS DESCENT) is a Central Florida “Must-See” this Halloween season! This year we did all 3 trails and the escape room. Truly creepy and sometimes terrifying, it’s the …show more most fun I’ve had all year. You guys are awesome! Amazing well planned out had a great time definitely worth the drive they do an amazing job with …show more everything Great actors great entertainment. If you want a good haunt with great scare factors this is where you need to come. And the attraction designs and layout are amazing. And PHENOMENAL customer service. Everyone there is great and their T-shirt souvenir stand had some really unique items and treats. Definitely and great attraction. This was such a blast, our whole group enjoyed! All the trails offered a little something different.